TOWIE star Lauren looked gorgeous rocking the Aloha kaftan at sunset in Dubai, teamed with loose waves and big earrings, she’s nailed that evening cocktail style. 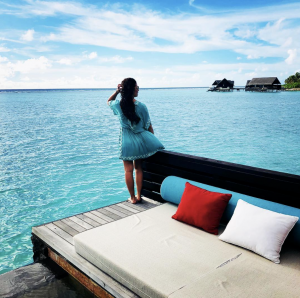 WAG and TV star Rebekah Vardy matched her look to the clear blue sea whilst on a romantic break in the Maldives with husband and England footballer Jamie. She teamed the Caliente kaftan with bare feet and the perfect Instapose. Influencer Mpho made her Estepona dress work for the city, too, teaming it with layered necklaces and the dreamiest of copper eyeshadows. Just gorgeous! Audrey, known for her popular Frassy Instagram page and blog, looked every bit the Spanish señorita in her Elviria top and skirt set. Showcasing her tan to perfection, she teamed the co-ord with matching nails, a statement hat and gold jewels and gave us outfit envy at its finest. To see Guilty Beach’s stunning range and get inspo for that next holiday, check out their website and keep an eye on their Instagram page for exclusive discounts and to see who wears the brand next!